100% xylitol. Keeps teeth healthy. Approved by the Oral Health Foundation. Sugar free. Gluten free. No aspartame. Suitable for vegans. Vegetarian Society approved. More than just a mint. These mints are sugar free and sweetened with 100% xylitol, which kills bacteria and helps prevent damaging acid attacks. 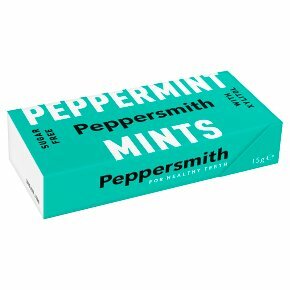 Protect your teeth by eating Peppersmith mints made with 100% xylitol instead of sugar to contribute to the maintenance of tooth remineralisation.